On this day last year, all the snow was long gone and mud season was over. Hosta and bleeding heart shoots were two or three inches tall. There were frogs’ eggs in the ponds and the grass was already green. It was a very early spring. Things are very different this year. MUD. Just lots and lots of mud. I feel your pain. We go through mud season here too but I don’t think it’s ever been quite as bad as it looks in your photo. But at least you have some gorgeous flowers to look forward to this year. So funny! I love this! WOW! What a contrast. 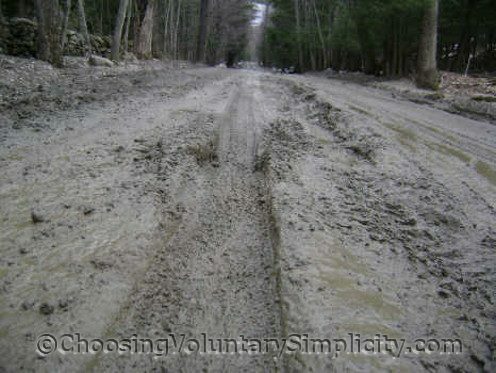 I’ve heard of mud season before but I’ve never seen it (I live in the city). It looks like you could lose your vehicle in that mud. Thanks for such a wonderful blog, I really like your calm and humorous approach. Yup, pretty bleak here, too. The snow is gone but the chill is still in the air. Today is dreary and rainy with some hail mixed in. Brrrrr! Love those primroses, Shirley! I’ve got to put some in. Any tips for those of us who have not grown them before? One happy thought – the spring peepers are in full song! Jo, I have found primroses to be exceptionally easy to grow. They like somewhat moist soil but the soil can’t be wet over the winter or they will die. The biggest problem I have found in buying primroses is in finding the hardy primroses. The nurseries around here often will have primroses that they label as hardy, but they won’t live through the winter… so I started most of my first plants from purchased seeds and in recent years from collected seed. As always, the collected seed germinates far better than the purchased seed.